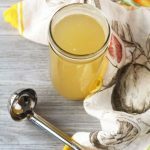 This Beef Bone Broth is loaded with flavor and nutrients and easily made in a slow cooker. 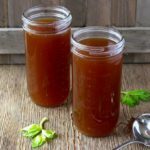 This bone broth recipe is great for sipping or as a base for soups, stews, sauces and to use as a cooking liquid. 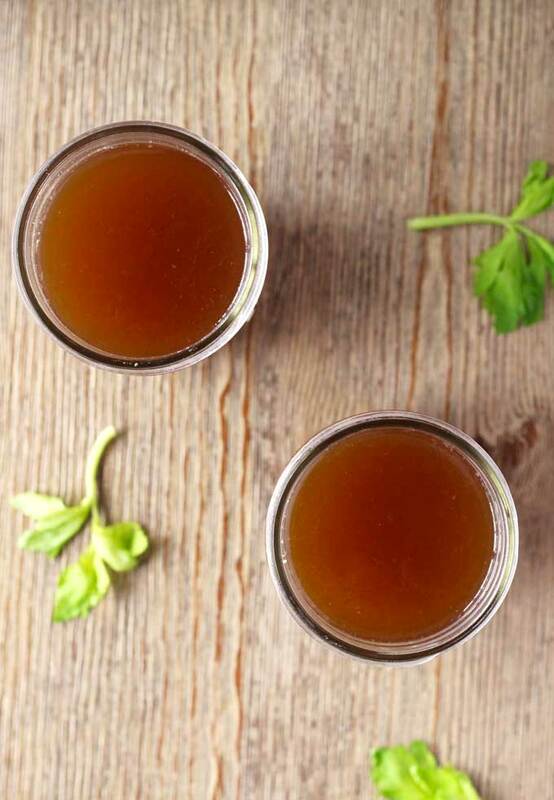 In many parts of the world bone broth is regarded as a “golden healing liquid” a “cure for all ailments”. In Peru where I grew up, a good bone broth is often called “levanta muertos” or “revive the dead broth”. Whether you are a believer of this magical elixir or you feel on the fence about it (I married an engineer and scientist – before I claim anything I need to have scientific proof of it. That means I have to have done extensive research, experimentation and some sort of lab testing is a must!) 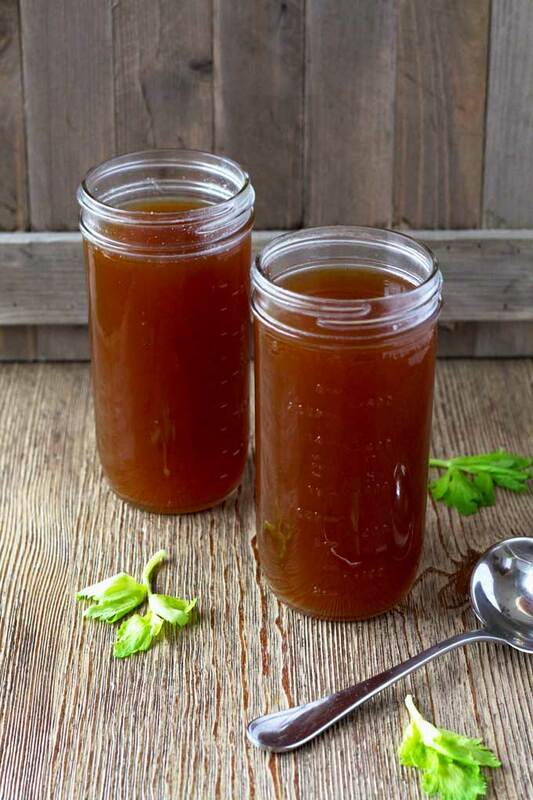 ~ one thing I can say for certain is that homemade bone broth is tastier that any commercially produced broth and as a cooking liquid it beats plain water any day! It all starts with the humble bone, in this particular recipe we are using beef bones. I recommend you use bones from grass-fed animals, when possible. A few vegetables, aromatics and an acid – in this case apple cider vinegar. The acid helps release calcium, magnesium, phosphorus, glutamine, proline and glycine into the liquid along with a slew of other amino acids (protein building blocks) into the broth. To get all the goodness out of the bones, we cook it low and slow for a long time – up to 24 hours. Don’t worry, no babysitting is needed (I love crock pots). Put all the ingredients into the slow cooker and forget about it (the great aroma will be the only reminder that you are cooking something). After the cooking is done, all you need to do is strain it and let it cool. As you can see from the photo below, all the fat will rise to the top. When cold, just remove the fat. I know some people use this fat for sauteing. In my case, I always discard it. You can refrigerate your slow cooker beef bone broth or freeze it for up to 6 months. Good for the Gut: The gelatin in the bones is beneficial for restoring strength of the gut lining and fighting food sensitivities (such as to dairy or wheat), helping with the growth of probiotics (good bacteria) in the gut, and supporting healthy inflammation levels in the digestive tract. 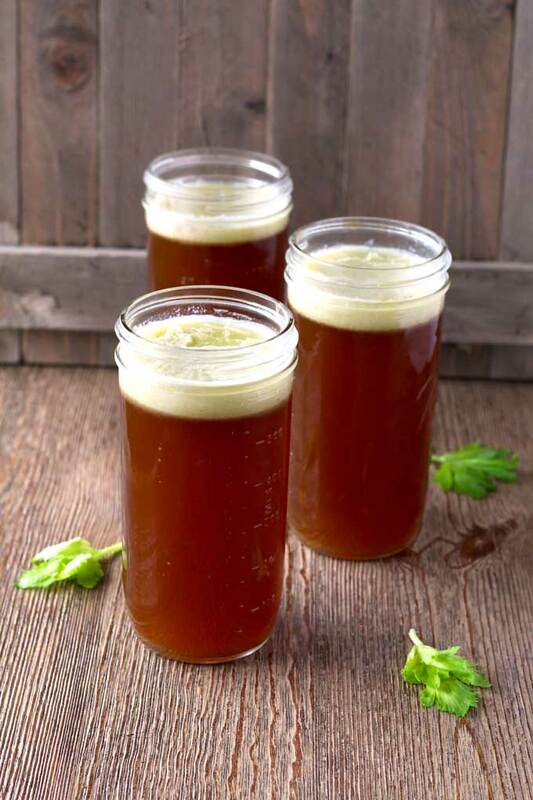 Protects joints: Bone broth is one of the best sources of natural collagen, the protein found in vertebrae animals — in their bones, skin, cartilage, ligaments, tendons and bone marrow. Great for the skin – again, collagen anyone??? Enhances nutrients and mineral absorption. Getting bones from humanly raised, pastured or grass fed animals from your local farmers is always best. Use organic vegetables, if possible. Even though you can just add your raw bones into the slow cooker to make broth, I like to roast my bones for 1 hour before adding them to the slow cooker. This steps guarantees a richer flavor and deeper color. Cook grains like quinoa and vegetables in bone broth instead of water for maximum flavor and added nutrients. 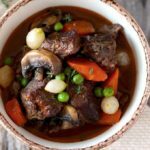 WANT TO TRY THIS SLOW COOKER BEEF BONE BROTH? PIN IT TO YOUR SOUP OR HEALTHY BOARD!! Place the bones in a baking sheet or roasting pan lined with foil or parchment paper. Roast for 1 hour flipping each bone once half way through the cooking time. Remove from the oven. Place the roasted bones, carrots, celery, onions, garlic, parsley, thyme and peppercorns into a slow cooker. Add water to cover the bones and vegetables completely. Add the apple cider vinegar. Set the slow cooker on low and cook for a minimum of 18 hours or up to 24 hours. Season lightly with salt if desired. Strain the broth through a fine-mesh strainer over a large bowl or pot. Discard the solids. Transfer the broth to multiple containers or jars and cool for about 30 minutes. Refrigerate for a few hours until the fat rises to the top and hardens. With a spoon scrape off the fat and discard. Refrigerate the broth in air tight containers up to 4 days or freeze up to 6 months. When cold, your broth may look a bit jiggly due to the gelatin from the collagen in the bones. When ready to use gently warm it up and it will return to its liquid form. I usually do not add salt to my stocks. When ready to serve season to taste. 1. How many pints are produced from the 4-5 #s of Beef bones/broth. 2. For consumption, what is a healthy dosage if I wish to consume this as a beef ‘tea’, rather than a soup. I’d like to maximize benefits and stretch the results, for as long as I can. I’ll keep the stock in the freezer. Hi Savvysue2012 I got about 3 quarts! I also use the bone broth to cook stews and soups. Thanks for this recipe. It was excellent! Will be making this every other week. Really helps with my lupus. I cook with it and sip it warm in the mornings. Thanks again. I did it also with a slow cooker for 23 hours but it did noz in a geli form evwn in the fridge .its just liquid… what i did wrong? My slow cooker is 140celsius fahrenheit in low modus.Is this to low? Your slow cooker should heat the food to at least 140 degrees within a four hour time frame. Also you can test your slow cooker by filling it with water halfway to the top. Put the lid on, turn it to low and let it sit for 8 hours. Remove the lid and check the water temperature. The water should reach 185 degrees Fahrenheit. About the broth – the broth gels when cooled because of the collagen in the bones. It is important to add the apple cider vinegar to help draw the collagen off the bones. If you follow the instructions and your slow cooker is working properly, then the issue is the bones. Not all bones have a ton of collagen. I will suggest you keep trying – buy your bones at a different store and make it again (make sure your slow cooker is working properly first!). Also, please know that bone broth is still nutritious even if it doesn’t gel. I am most concern about your slow cooker. Soups and stews are not safe to consume if they only reached 140 degrees F at the highest temperature.